This entry was posted in autumn, life, urban nature-pockets and tagged fauna, flying south, harbingers, insect life, notable phenomena, sightings on August 25, 2014 by misshermit. Absent since spring migration sightings, a few robins have reappeared in the neighbourhood briefly. Two juvenile robins… or possibly another type of smaller-sized, adult thrush… hopped and hunted their way through the yard – subtly rust-coloured, mottled breasts. A single adult robin seen nearby another day. Most recently, an adult robin lying dead in the alley with a throat wound… the same bird? Other places are alive with birdsong in the summer, while this area seems quiet by comparison. This entry was posted in life, nature fix, summer, urban nature-pockets and tagged birds, fauna, migration, notable phenomena on August 9, 2014 by misshermit. A week ago in the park, unusual feathers covered the ground. They were fluffy, with blunt tips. Yellowish fuzzy tendrils so fine that they clung to everything the feathers touched. Brown and white, barred with darker brown. It was hard to find any good ones to bring home because they appeared to have been through a lawn mower. I assumed from all the feathers that a bird had met its fate there – perhaps a passing coyote? I’m not familiar with identifying birds by their feathers (except for the brilliant yet ubiquitous Magpie) but my guess was an owl, based on my amateur intuitive reasoning that if the shape of the parts resembled at all the shape of the whole – that squarish, blunt shape & bars just seems owlish! 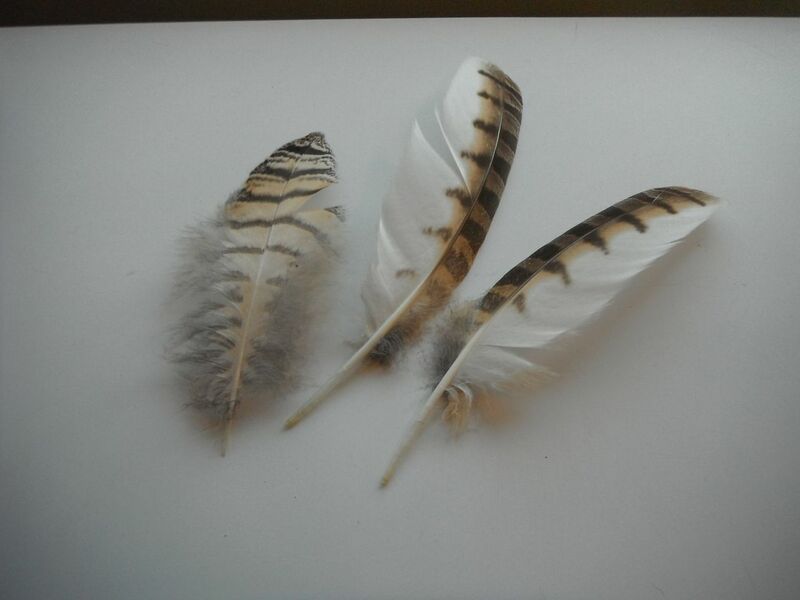 Today passing through the park again, I was surprised to see fresh feathers, these ones unmown and in great shape. This batch was less fluffy than last week’s, and didn’t have such square tips. Perhaps the bird is alive and well, after all! It dawned on me that there may be a juvenile owl just getting her first adult suit – from the fresh supply and the reduced baby-fuzziness. Peering into the treetops in the bright sunshine I couldn’t see any sign of the little(?) one, though. If it is an owl, it’s come to the right place – plenty of young jackrabbits to meet any carnivorous appetite in these parts! Looking again at the colouring, I remember the last mystery bird in the neighbourhood – the Ring-necked Pheasant… Maybe I’ll have to do some research on this one! 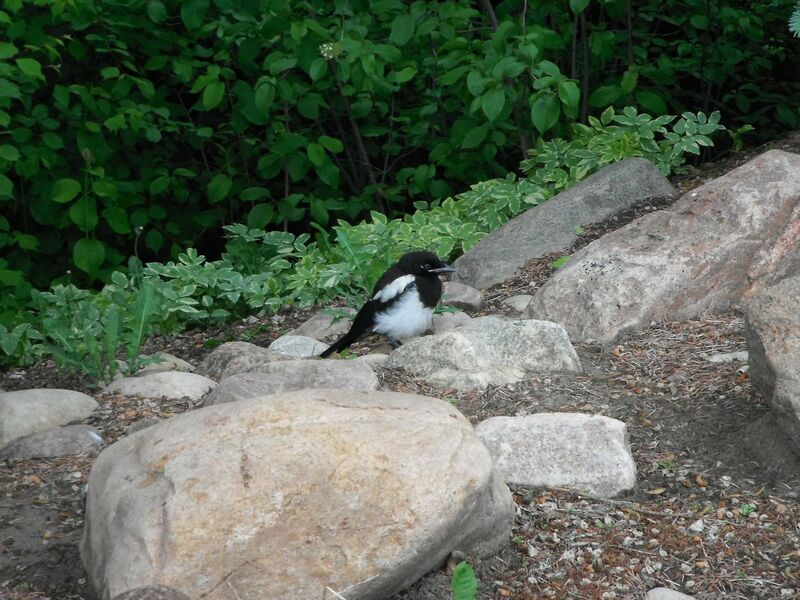 This entry was posted in life, nature fix, urban nature-pockets and tagged birds, fauna, notable phenomena, sightings on July 28, 2014 by misshermit.